Begin heating 1/4" to 1/2" vegetable oil (I like canola) in an electric skillet or large frying pan to medium high. Peel potatoes and onion, then shred in a food processor. Mix potatoes and onion with seasonings, then place in a colander either over a large bowl or in the sink. With clean, wet hands, place a handful of the potato mixture between palms and squeeze out any additional moisture while making a nice palm-sized patty. Gently place the patty in the heated oil, and continue squeezing and shaping latkes until out of room in the skillet. Fry until bottom side is golden brown , then flip over and cook until second side is also a lovely shade. Place on paper towel to drain, then step back as it is snatched up and eaten. Continue the latke assembly line until all the potato mixture is gone. Serve with Tofutti "Better than Sour Cream" or applesauce. 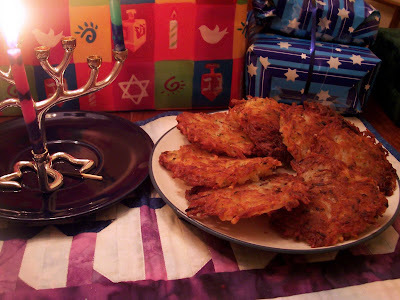 Last year was the first time I came across Latkes, so I was quite keen to try these. It surprised me how easy they were to make and how crispy and delicious they were.